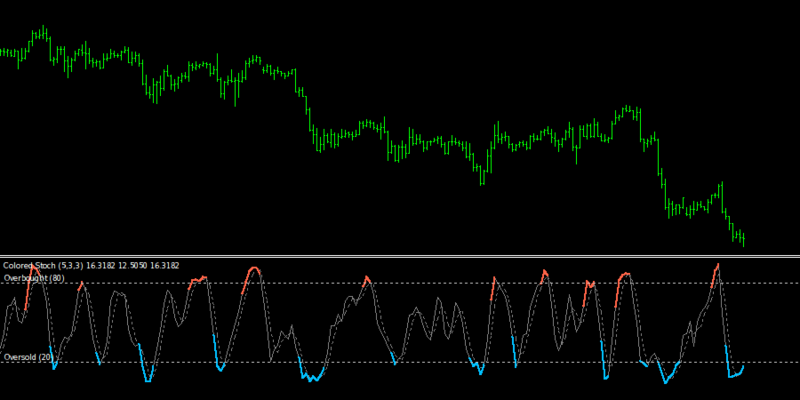 Get the Colored Stochastic Oscillator Indicator! The Colored Stochastic Oscillator shows exactly the same lines as the default Stochastic Oscillator does, but he shows the OverSold and the OverBought levels in color. Sell if the Stochastic line is red. Buy if the Stochastic line is blue. Trade the Stochastic Oscillator fully automated with the Stochastic Oscillator EA. You can install the Colored Stochastic Oscillator Indicator on limitless demo and live accounts. Pls, can it be set and entry and exit just as painted? Check out the stoch EA for this. It automatically buys and sells on these levels. Hi Yannick I have down loaded your free coloured stoch but it does not run in strategy tester. What could the problem be. I down loaded again still the same . I just tested it and it works fine on my machine. Have you installed it correctly in the MQL4/indicators folder? Does it work on a live chart? Hey yannick, I love your indicator is still working? I want to buy it. Ability to set Stochactic at 15% and 85% less false trades more profits longer trends. Combine these 2 indicators together. Make it the 15 minute time frame. Take profit after the candle breaks the middle BBand, or trailing take profit. stop loss can be set if candle breaks above initial entry. Please i am hoping we can put something together. You can set the Stoch Level to 15 and 85. Yes I can do it for you. Please send me the complete strategy here and I will make you an offer. is there a phone number I can reach you at if so best time. Unfortunately I’m only reachable by mail. Just click on add to cart > checkout and follow the steps.